PM Modi reached Mr Patel's residence before attending the ground breaking ceremony of the Mumbai-Ahmedabad high speed rail project near Sabarmati railway station in Ahmedabad with his Japanese counterpart Shinzo Abe. Gandhinagar: Prime Minister Narendra Modi today took out time from this busy schedule to meet former Gujarat Chief Minister Keshubhai Patel and express his condolences over the death of the latter's son. Keshubhai Patel's 60-year-old son Pravin Patel, who was settled in the US, died of cardiac arrest on September 9. 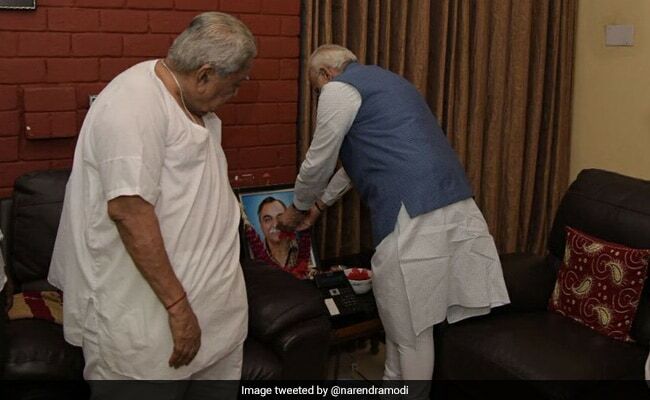 "Met Shri Keshubhai Patel at his residence and offered my condolences on the unfortunate demise of his son, Pravin Patel," PM Modi tweeted after meeting Keshubhai at his residence. The prime minister also tweeted a picture where is seen offering flowers at the photo of Pravin Patel. BJP president Amit Shah and Union Finance Minister Arun Jaitley had also visited Keshubhai Patel's residence few days back to condole his son's death.